Foreground: Samus Aran. Background, left to right: Spire, Trace, Kanden, Sylux, Noxus, and Weavel. Metroid Prime: Hunters is a game in the Metroid series, released on the Nintendo DS in 2006. A Gaiden Game to the Metroid Prime Trilogy, it was developed by the Nintendo Software Technology Corporation- Nintendo of America's in-house development studio- rather than Retro Studios as with the other Prime games. While it was released after Metroid Prime 2: Echoes, the game takes place before it in the official timeline, making it the third entry in the series' chronology. The plot sends Samus Aran to the Alimbic Cluster, a mysterious area of the Tetra Galaxy where a lost race called the Alimbics once had an interplanetary empire. After the Galactic Federation intercepted a telepathic message claiming that "the secret to ultimate power resides in the Alimbic Cluster", they contracted Samus to travel to the cluster to find the truth behind the message. Of course, other bounty hunters have followed the message as well, seeking the ultimate power for their own reasons, so Samus must fight off these rivals as she attempts to solve the mystery of the Alimbics. Like the console Prime games, Hunters plays in a first-person perspective, and includes numerous lore scans to reveal the game's story and details of the world. It tends to be less focused on exploration than other Metroid games, however, being closer to a regular First-Person Shooter, though new weapons will allow access to new areas of previously-explored planets. Alongside the single-player campaign, Hunters also includes a multiplayer mode, playable through local wireless as well as (formerly) online through the Nintendo Wi-Fi Connection. This mode allows any of the bounty hunters to be played, each of whom has their own signature abilities. 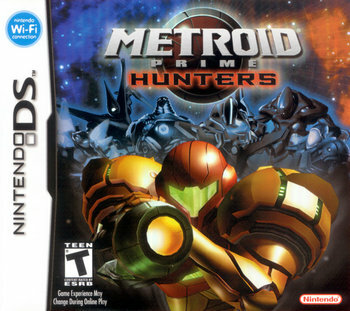 An early demo version of the game called Metroid Prime Hunters: First Hunt was packed in with the Nintendo DS hardware for a while, which included three single-player modes as well as a local multiplayer mode. Kanden was created in a lab to be the ultimate soldier, but is more interested in proving he is the ultimate hunter. Spire belongs to a supposedly-extinct race, and is seeking the ultimate power in hopes that it'll bring him answers regarding what happened to them. Trace is attempting to secure the ultimate power for the Kriken Empire. Noxus is trying to prevent the ultimate power from falling into the wrong hands. Weavel wants revenge on Samus, as she was directly responsible for his injuries. Sylux is the exception, with no backstory other than the fact that he's there and uses stolen federation equipment. The Shockcoil is said to fire concentrated blasts of neutrinos, particles which are so small that trillions of them are basically harmless. Must be a lot of neutrinos. Subverted with the Judicator. "Cold plasma" may sound like an oxymoron, but it actually is possible to supercool plasma with a laser. Ascend to a Higher Plane of Existence: The remaining Alimbic were said to have given themselves up to create the seal sphere, but in the final boss's second phase it is said their presence has left it and they semi-inexplicably show up in the game's ending so Samus can wave at them, suggesting ascension happened. Inverted with Gorea: lore indicates that it descended from an ascended state to a physical one just so it could destroy the Alimbic. Armless Biped: The Guardians are built this way, in addition to having a body that's pretty much all eye. Awesome, but Impractical: Oh god, the Omega Cannon. A Painfully Slow Projectile that will explode in contact with anything... with the strength of a nuke. The explosion will One-Hit Kill anyone in the blast radius (in multiplayer, anyway, the story's boss is a tad more resilient), including yourself, and blind everyone else for a few seconds. Oh, and it has only one shot, after which you have to go get it again (which requires climbing the entire Oubliette map, the only one where it spawns). Utterly impractical and an absolute riot to use. Bag of Spilling: Unlike the first two Prime games, this game doesn't have any explanation for why Samus starts out with just the Varia Suit (though there are no suit upgrades in this game anyway), Missile Launcher (not even loaded when you first start), and the Morph Ball (with bombs and boost included). Bait-and-Switch Boss: During the escape sequence after beating the first Arcterra boss, you run into a Guardian, who just love to ambush you during escapes. However, in just one second after it appears, a hunter, Trace, kills it and proceeds to attack you. Barrier Change Boss: Gorea's first form. The Battle Didn't Count: Any time you beat a Hunter, they'll just vanish, before returning to fight another day. Kanden's alt form, the Stinglarva, has a detachable stinger tail that acts as a homing missile. The third limb on Trace's alt form, the Triskelion, functions this way, though whether it's a tail exactly is up for debate. Bilingual Bonus: Kanden's name means "electric shock" in Japanese. Boom, Headshot! : Hitting someone in the head consistently deals more damage, and it's a One-Hit Kill if someone zooms in while using the Imperialist. Bottomless Pits: Unlike the console Prime games that include them, falling into a bottomless pit will instantly kill Samus, rather than just drop her back at the ledge where she was with a slight loss of energy. Capture the Flag: Bounty Mode in multiplayer has teams of hunters compete with one another to acquire octoliths and take them back to their bases. Color-Coded for Your Convenience: Doors and force fields are colored to match the weapon that will open them. The color coding is different from the console games, though- the light blue color is taken by the Shock Coil weapon, so regular doors are now colored gray, and missile doors are now colored brown. Cutscene Power to the Max: Gorea is so built up by lore as being invincible so you'd think the final fight would be massively challenging. In its introductory cutscene, it even curbstomps all the other six hunters simultaneously. But nope. Gorea is by far the easiest final boss of all the Prime games, and is in fact MUCH easier to defeat than some of the previous bosses in that game that were placed there as tests of skill to prepare the hunters for Gorea. Which makes total sense when you think about it. Cyber Cyclops: The guardians and the slenches. The guardian's have a weak spot and their eye it ain't. Deadly Upgrade: Becoming the "Prime Hunter" in the multiplayer mode of the same name gives you a great boost in power but also slowly kills you. The only way for a Prime Hunter to stay alive is to continue killing off opponents faster than the opposition and their deadly condition can do them in. Degraded Boss: The first fight with a given Hunter is always relatively difficult. After that, they become only a little worse than nuisances. Detachment Combat: Weavel's body splits apart at the waist, and the bottom half becomes a turret, while the top half starts bouncing around and slashing at you with a sword. Justified, since he is mostly robot (he just has a brain and spinal cord left). Doomsday Device: The Alimbic built the Omega Cannon to stop Gorea, but decided against using it for fear that Gorea would be able to mimic the cannon's power. In the game proper the Omega Cannon is the only thing that can harm the otherwise invincible Gorea. Eldritch Abomination: Gorea, whose backstory is right out of the Lovecraft playbook: a formless, starborn evil who crashed into the Alimbic System and started killing everything in sight, absorbing and copying any and all weapons thrown at it. It eventually takes imprisoning it away in an extradimensional tomb. Needless to say, it wants out. Bad. 11th-Hour Superpower: The Omega Cannon is unlocked during the second and final boss fight with Gorea, during which it's the only weapon that can damage him. Enemy Mine: Implied in Gorea's introductory cutscene, where the other six hunters are all shooting at Gorea's Sealing Sphere, instead of each other or Samus, as they've been doing throughout the game. Escaped from the Lab: Kanden was an attempt by scientists to create an invincible soldier. What they created was an insane killing machine that's virtually indestructible, who slaughtered all the scientists who built him and escaped from the lab before it exploded. Eternal Engine: Celestial Archives and Vesper Defense Outpost. Everything's Better with Spinning: Noxus's alt form, the Vhoscythe, and Spire's alt form, the Dialanche, attack by spinning limbs and large chunks of rock, respectively. Final-Exam Boss: Gorea forces you to remember which color represents which weakness (much like the Metroid Prime and Emperor Ing did) and also to remember obscure lore you found throughout the game to know in which order to shoot crests on the walls with the proper weapon in order to get to the final phase of the battle and the game's true ending. Floating Limbs: Neither Krikens (Trace's species) nor the Alimbics have necks. Instead their heads just float a few inches above their shoulders, somehow. Gorea has the same thing going, looking like a three legged Alimbic, except his legs aren't attached either. Frickin' Laser Beams: Trace's Imperialist takes this form, and if whoever's on the receiving end takes it to the head, it's a One-Hit Kill, provided Trace was zoomed in on it. Unlike most examples the imperialist does pretty much hit as soon as fired, but like most examples it also gives away the position of the shooter. Gone Horribly Wrong: Kanden was part of a science experiment to create supersoldiers. They got the super part right, but his mind is too unstable for the army. His intro cutscene might involve him blowing up the laboratory he came from, but it is never stated outright. Good vs. Good: Samus vs. Noxus has this dynamic more than with the other hunters. Noxus is a very justice-minded individual who just wants to keep less scrupulous hunters from getting hold of a dangerous power. Unfortunately, he thinks this also includes Samus. Grey and Gray Morality: The hunters range from well-intentioned to selfish to bloodthirsty. Samus is merely commissioned to discover the source of the message. Spire wants to find out what happened to his people. Noxus wants to be sure no one gets the ultimate power. Weavel wants it for the firepower, Trace wants it for conquest, Sylux wants it for revenge, and Kanden wants it because he's crazy. Half the Man He Used to Be: Weavel has this weaponized. At any time he can split his body in half through the midsection, causing it to become two autonomous halves. The top half is player-controlled, walks on his hands, and wields an energy scythe. The lower half becomes an automatic turret, letting Weavel defend one area while his upper half hunts around. Harmless Freezing: Noxus's Judicator can do this if it's in his hands and fired at a close range. Ice Voldrums and the Arctic Spawn can also produce this effect. Homing Projectile: The volt driver when used by Kanden, missiles when used by Samus. The Shock Coil comes close, too, as it'll automatically hit if used within a given range of the target, but is completely wasted otherwise. An Ice Person: Noxus's species, the Vhozon, comes from a very cold planet. His signature weapon is the Judicator, which can freeze enemies with a charged shot. Kanden's Stinglarva form was created using the material of predatory insects. Kanden himself resembles a caterpillar, albeit bipedal and heavily muscled. Trace's people resemble insects, due to their very thin limbs. Interface Screw: A charged Volt Driver shot will distort an enemy hunter's visor. Last of His Kind: Spire is the last known Diamont, people made of rock. He hopes that finding the ultimate power will let him discover what happened to them. Lethal Lava Land: Alinos was the Alimbic homeworld, but became this once the planet's core became unstable. Life Drain: Sylux's Shock Coil will drain health from the opponent if he's using it, which helps make up for the short range. Mêlée à Trois: When Samus first encounters Noxus and Trace on Arcterra, a three-way fight between them ensues. Fortunately, Samus only needs to focus on fighting Noxus, since Trace will retreat once Noxus is defeated. Multiplayer-Only Item: Death alt is a temporary powerup that gives the morph ball an instant death radius similar to the hyper ball from Metroid Prime Pinball. Multiple Endings: Killing Gorea's first form without activating the nodes around the battlefield first will cause the Oubliette to explode without any scene of Samus escaping. Activating the nodes and then killing Gorea's second form will depict her and the other Hunters escaping the collapsing Oubliette. Oculothorax: The Guardians' heads/torsos are pretty much all eye. Opening the Sandbox: After collecting the second Octolith all four worlds become available to explore. Since none of the bosses grant ability upgrades to explore more of the map, you're free to backtrack and collect the majority of expansions in the game before collecting the third Octolith. Personal Space Invader: Quadtroids, which look like large bug with a Metroid for a head. Their leech sucker mouths stick to your visor and drain your health. Playing with Fire: Spire's Magmaul, and by extension, Spire himself. Proud Warrior Race Guy: Noxus and Trace basically represent good and evil variants, with the Vhozon described as a highly respected race of peacekeepers while the Kriken are implied to be even more sadistic than the Space Pirates. Of course, they're both going to try to kill you if you run into them. Race Against the Clock: After you collect an Octolith, you're forced to quickly escape the planet due to a security system. Remember the New Guy? : According to the manual, Weavel is a former Space Pirate Samus wounded on Brinstar, though the previous Metroid games there had no Space Pirates fought at Brinstar.note Metroid 1 had no Space Pirates at all, Metroid: Zero Mission had them encountered in the Pirate Mothership and Chozodia. Replay Mode: The save file select screen includes an option to rewatch most of the game's prerendered cutscenes. Rule of Three: Each teleport pad leading to a boss room is unlocked by three Alimbic Artifacts. Save Point: Samus' gunship is the only save point, but it's possible to active teleport spots leading back to the ship from deeper into each planet, making it easier to find a place to save. Shock and Awe: Kanden's Volt Driver does this explicitly, inflicting anybody it hits with an Interface Screw, to boot. Sylux's Shock Coil seems to do this, too, though the beam's stated to be made from neutrinos. This game provides some very interesting numbers on the weapons of the Metroid universe. The Volt Driver apparently has enough juice to power countries, the Judicator approaches Absolute Zero, the Battlehammer contains a nuclear reactor, and the Magmaul utilizes hydrogen the same way stars do. At this rate, it'll be able to compete with 40K in over-the-top weaponry. Additionally, Hunters is stated to take place in another galaxy. Not only does this imply that the Galactic Federation in general and Samus' gunship in particular has technology that allows it to span the intergalactic void in trivial amounts of time, it also causes issues when recurring enemies (like Zoomers, War Wasps and Blastcaps) appear. Blastcaps are even stated to have spread from Tallon IV using space spores. Assuming spores that don't travel faster than the speed of light, the time this would take is far greater than the age of the universe - and that's not even counting the time it would take them to have evolved on Tallon IV in the first place. Sealed Evil in a Can: Gorea was trapped inside a prison called the Seal Sphere, and then that was placed inside a larger prison called the Oubliette, which was then sent into subspace. By finding the Octoliths, Samus brings the Oubliette into 3D space, and then the other Hunters break the Seal Sphere open, thinking it has the ultimate power. Samus can reach the end of the Piston Cave (and skip the entire sections of it) by unmorphing at the Morph Ball tunnel in the Processor Core and performing "Missile Pushes" to blast herself into the tunnel. The battle with the Barbed War Wasps in the Ice Hive can be skipped via Missile Jumping to reach the ledge where the Missile Expansion is located. The Smurfette Principle: Even with six new bounty hunters in the mix, Samus is still the only confirmed female. The Spook: Good luck figuring out anything about who Sylux is or where he(?) came from. Stuff Blowing Up: Anything that can die and isn't a hunter or a Guardian goes out this way. Quadtroids fill the role of energy-leeching enemy that clings and has to be removed with Morph Ball weapons. The Petrasyl enemy is similar to Super Metroid's Mocktroids, in that they look similar to Metroids but are weaker. The Turret Master: Weavel does this in his alt form, the aptly-named Half Turret. Unflinching Walk: Kanden does this in his intro cutscene after crawling out of a facility that explodes soon afterwards. Uplifted Animal: It's hinted that Kanden is this. It's said that he was once a creature called an Enoema taken to be turned into a supersoldier. The neural combat programming being forced into his brain was too much for him to comprehend, turning him into a savage monster. The Worf Effect: Trace pulls this, one-shotting a Guardian before turning his attention to Samus. Gorea does the same later, simultaneously wiping out all six hunters in a single stroke.